Erica Jensen is co-owner and President of Clean Right Company. A Spokane based cleaning service provider, since 2002, for home and office, carpets, windows and post construction cleaning. Your Forced Air Heating/Cooling System Can Help Keep Your Home Cleaner! One thing I know most people dislike doing is dusting. However, it is very important to keep the dust count down in our homes so we are not inhaling dust particles with every breathe. Even if you don't have allergies, having clean air in your home is very important. Forced air system- a furnace that pumps the air through air ducts and out through registers in your floors or ceiling. Make sure you change/clean your filter monthly. As the dust builds up on the filter it can no longer do it's job. Have your duct-work blown out at least once per year. Dirt and dust settle in your air-ducts and get blown through your home when your air turns on. Purchase, or make, filters for your floor/ceiling register. 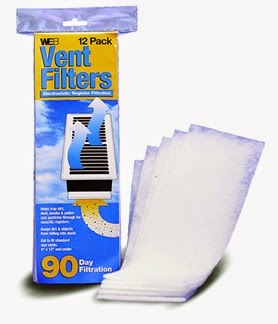 If you make your own filter, ensure that it is made of a fabric that will allow air to flow through it. Any remaining dust will get trapped in the additional filter before it can be pumped into your home. Keep these filters clean by taking them out and washing them or replacing them, at least once a quarter, if not more often.